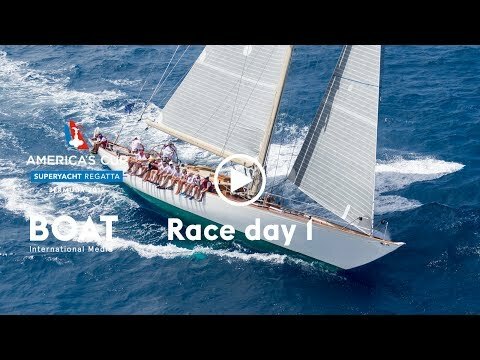 If the turquoise waters off Bermuda’s north coast offered a gentle, benign start to the America’s Cup Superyacht Regatta 2017 there were few complaints from the 19 crews who enjoyed a relatively straightforward Race Day One, in association with Rego Sotheby’s International Realty, a coastal round the buoys passage contest of between 13 and 16 miles. 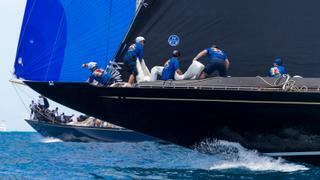 In the competitive five strong J Class fleet, racing in association with Bermuda Business Development Agency, Hanuman came back from a premature start to recover quickly and take the race victory ahead of Ranger. 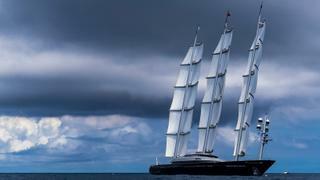 The biggest Superyacht in the fleet, the iconic 88m Maltese Falcon scored the biggest win in the regatta’s biggest division Class C. 44.8m Visione, the Reichel Pugh design laid down a marker by winning Class A, Hyperion the 48m Frers design with Harold Cudmore calling tactics, triumphed in Class B. 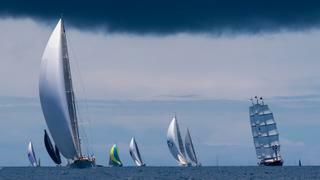 The J Class fleet started first. Hanuman were a little too eager on the start and nudged over the line by Topaz, making them just seconds early. The wind pressure was building from the right flank of the first upwind and the Hanuman afterguard were able to engineer a smart bounce back, choosing the right side along with Velsheda and Topaz. At the first windward mark Velsheda came in with pace and were able to just round ahead of Hanuman. Setting a spinnaker cost Velsheda initially, ceding the lead to Hanuman who set a reaching sail later on the leg and were able to ease away. The final short beat was as fickle as the first upwind. Ranger came through strongly to steal second. 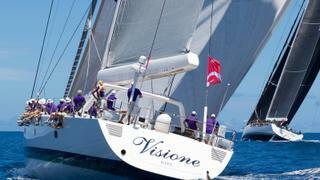 The same key factors were fundamental to Hyperion’s win, holding on to their spinnaker when the reaches got tight. Hyperion, with veteran Cudmore aboard, sailed smoothly to hold off Action which has Shirley Robertson and Ian Walker as a formidable afterguard along with navigator Marcel van Trieste. 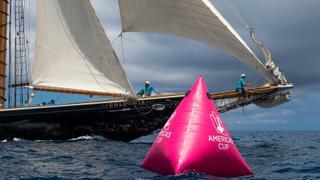 The remarkable livewire Loick Peyron found a temporary salve to any disappointment that his Artemis Racing team did not manage to progress to the America’s Cup Match, falling 5-2 to Emirates Team New Zealand. 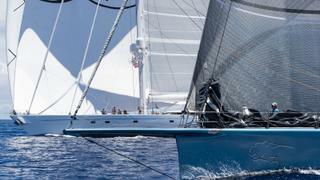 The past Jules Verne Trophy round the world record setting skipper and winner of the last Route du Rhum solo transatlantic race, is steering the Farr designed 35m Sojana, this week.